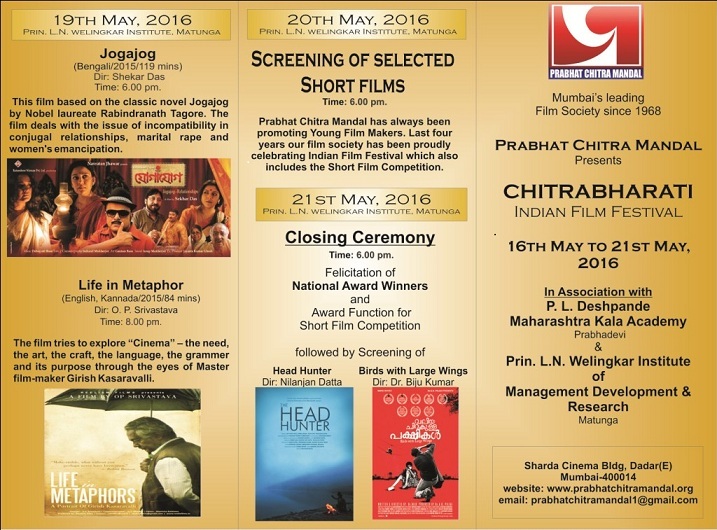 Indian Regional Cinema is growing from one milestone to another with strong themes, content and technical excellence. The new breed of Filmmakers from regional streams is acknowledged with National and International awards for their work. WeSchool feels proud to join hands with Prabhat Chitra Mandal to host the 4TH INDIAN FILM FESTIVAL, CHITRABHARTI, which has now become a significant annual event for the city of Mumbai that not only creates an opportunity to showcase meaningful regional films but also honors the spirit of first-time movie-makers along with Maestros from the world of celluloid. WeSchool offers a 11 month PGP–Media and Entertainment and has recently got approval for a two year, full-time PGDM in Media and Entertainment as well. “Films linked to the Teaching-Learning Plan based on the curriculum help the young MBAs at WeSchool develop a better understanding of global markets, finance, investments, supply chain, entrepreneurship and ethics. More importantly it helps them develop a worldview with global awareness , an understanding of the national agenda and sensitivity to societal issues which contributes to their holistic development. “, says Prof Dr Uday Salunkhe, Group Director, WeSchool while sharing his thoughts on hosting the film festival in the B School environment. Indian cinema is not just Bollywood. As Tamil and Telugu films continue to lead with a large number of releases this year, Marathi, Bengali and Malayalam film industry also managed to showcase good cinematic content. Some of the best films in different Indian languages this year have a few things in common: they have been made on economical budgets by first-time directors, did not feature stars and yet managed to appeal the audience’s sensibilities and top the box-office charts. Regional Cinema is by and large seen as cinema with a purpose that is different from the popular ‘mainstream ‘variety. It is an important medium that showcases and comments on the regional socio-economic-political life of India. The diverse regional cinema in India strive to maintain their distinctive identities and provide a close view of the cultural wealth, political upheavals, social issues and problems both in the urban as well as rural environments. As films become accepted alongside literature, theatre, art, dance and music in schools and in the broader sense as a combination of all these art forms, have also emerged as a powerful educational tool. With a great influence on the attitudes and beliefs, tastes and feelings, mass consciousness of millions of people, the cinema plays on important role in the social, moral, political and economic life of the society. It encourages social awareness and critical debate among students and teachers alike. Sometimes a movie can include moments that go beyond what is being taught in the class and highlights other important topics. For example, in recent times ,Bollywood films like ‘Chak de India’,’Rang De Basanti’ ,’Swades’,’Tare zameen par’,’English Vinglish’,’Aligarh’ and ‘Fandry’,’Court’, ‘Retee’,’Vihir’,’Devool’ from the Marathi milieu have provided the discerning viewers with a better awareness, deeper understanding and created empathy for societal issues in their hearts. The use of films in a classroom environment therefore helps extend the learning beyond the textbook, builds interest in a new field of study, contributes a learning style that’s stimulating and also provides moments of introspection . Including films in day-to-day learning certainly enhances learning and increases knowledge on the topic at hand making a direct impact on the psyche. Having understood this, WeSchool at its Learning Resource Center has set up a Media Alcove that stocks a sizable and varied collection of Audio Visual materials in the form of Audio-Video Cassettes, CD-ROMs and DVDs that are of educational as well as include feature films from Hollywood, Bollywood and regional cinema. Apart from the fact that WeSchool’s PG Programs in Media and Entertainment have included subjects like film appreciation, film marketing, film production and script writing in its curriculum, film viewing and case studies based on films is a part of its management and marketing curriculum across its other flagship programs. With ethnographic research becoming the key to strategy, central to gaining a full understanding of customers and the business itself, what better way is there for the young MBA to make a beginning in understanding the markets then watching regional films? It’s always a preferred method that the young researchers visit the stakeholders on their home grounds to observe their behaviors and listen to their stories but they can certainly orient themselves through regional films before starting on the journey to have an interaction with the stakeholders. Thus films form the backdrop to learn about the strategic management and behind-the-scene aspects of trend-setting films, people and organizations. Films provide an understating of the impact of technological change and the role of creativity and innovation in Business and it is but natural that WeSchool’s flagship programs like E-Biz, Business Design & Innovation, Rural Management etc., are using films as an effective medium to create the out-of-box thinking and making students’ learning much more innovative and interesting than the nitty-gritties of regular management content and pedagogy. Hosting Chitrabharati, a festival of regional films is certainly another important step in placing Cinema at the heart of learning experiences at WeSchool. Chitrabharti will feature National award winning films like Aushadh , Paywaat and Head Hunter along with other acclaimed films like Koti, Halal, Highway, Birds with large wings, Jogajog and Onyo Opala. Short Film Competition, Poster Exhibition, Documentary screenings are other fabulous features of CHITRABHARTI that started at the Pu La Deshpande Kala Academy on 16th May and continues at WeSchool from 18th to 21st May. The book ‘OSCAR 10’ authored by Ms. Aparna Patil was released at the hands of Actor -Director Subodh Bhave on 17th May. The Closing Ceremony at which National Award winner artists and Short film makers will be felicitated will be held at WeSchool, Matunga, on 21st May at 6 pm.